Welcome to the first of Grant Potters web pages, an attempt to share with others some of the knowledge Grant has accumulated about teamracing. 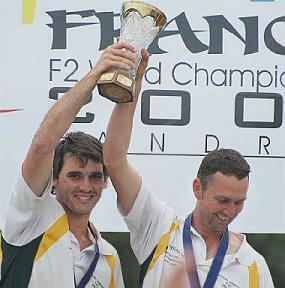 At the pinnacle of his aeromodelling career so far, Grant (right) is pictured here with Hugh Simons at Landres, France in 2008, with their World Championships trophy for winning F2C. Pressurized Tank Photos and drawings of Grant's multi-chambered refuelling tank. Vintage A internals Revealing photos of a winning Vintage A teamracer. CNC router Purpose built router for accurately machining model components. Practise Flying Circle Specially made flying circle for practising F2C. Carbon Fibre Moulded F2C Wing Complete manufacturing process explained. Carbon Fibre Cooling Duct & Wheel Mount Complete manufacturing process explained. 2010 World Champs F2C plan The Simons/Potter model in pdf format. Developed April 2009 by David Kidd. Your Webmaster is Ron Chernich.